This site is dedicated to articles of interest to the Civil War collecting community especially Confederate.We will occasionally blog about upcoming auctions, web sites and Civil War collector shows. We invite articles of interest about collecting Confederate items that you would like to share with the internet public. The surrender of the Army of Northern Virginia.
. A REBEL RELIC IS REDISCOVERED. President Carter visits his Confederate ancestors uniform. THE FRENCH INFLUENCED CONFEDERATE KEPI. PEYTON H. COLQUITT. A brave Georgian and a true hero. TO KEEP AND BEAR ARMS. SOUTHERN SHOTGUNS OF THE CONFEDERACY. "Arm the troops with anything that can shoot." GLORIOUSLY BORNE. ARMY OF TENNESSEE DEPOT ISSUED FLAGS. "The last flag issued to Johnston's Army." BOYS, THEY HAVE KILLED ME, BUT GO ON. 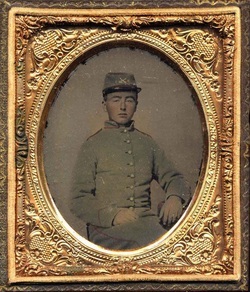 THE SAD STORY OF CHARLES A. HAWKINS OF THE 38TH GEORGIA INFANTRY. "One of the first men killed in the Gettysburg Campaign". THE LIFE AND TIMES OF C.R.REES CONFEDERATE PHOTOGRAPHER." 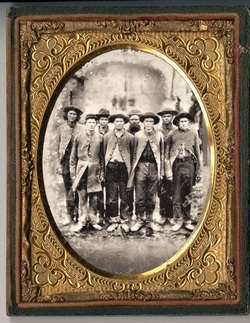 The Leonardo Da Vinci of Ambrotype artists working during the Civil War". THE STORY OF THE 20TH TENNESSEE INFANTRY. "Just about one of the hardest fought regiments in the Army of the Tennessee". The Museum of the Confederacy Flag Collection. Simply put, the best collection of C.S. Flags anywhere. The North Carolina Division of Archives and History. Wonderful search engine, great for uniforms, well organized. Library of Congress Liljenquist Collection of Civil War Images. Easy to use over 200 C.S. soldier hard images. Vanishing Georgia.Good search engine for Georgia Confederate images of soldiers and reunions. Columbus Depot Jackets. Large site devoted to the Orphan Brigade by Geoff Walden. Generals in Black and White. Archived site with all known pictures of C.S. Generals. The best resource with rare images. Richmond Depot Jackets. Les Jensen's magnificent article was the first serious study of C.S. uniforms. Georgia Flag Collection. Collection of Georgia CS flags. The Lawrence T. Jones III Collection of Texas Images. Lots of great Texas CS soldiers from the SMU Library. Texas Library and Archives. Small selection of rarely seen flags. Tennessee Digital Images. Hard to find site from Tenn. Library and Archives. Some nice C.S. Stuff. Georgia Historical Society. Pretty decent site with varied items. ITS NOT THAT HARD, YOU CAN LOG IN WITH ALMOST ANY EXISTING E MAIL ACCOUNT, FACEBOOK, TWITTER, LINKEDIN, ALMOST ANYTHING WILL WORK. JUST HIT THE LOG IN OR SIGNUP BUTTON AND YOU CAN USE ANY EXISTING ACCOUNT YOU HAVE. OR YOU CAN SIGN UP DIRECTLY VIA WEEBLY IF THAT WORKS FOR YOU. PLEASE NO POLITICS, HATEFUL OR MALICIOUS COMMENTS. EVERYBODY IS WELCOME JUST KEEP IT CLEAN, NO EYE GOUGING, NOSE PULLING OR RABBIT PUNCHES.